Like everyone else, I’m excited when a stock I hold increases the dividend. Dividend increases in recent years have been very strong. TD Bank (TSX: TD), for instance, has raised its dividend from $1.12 per share in 2002 to $2.36 per share today, a compounded annual rate of more than 12% per annum. The joy of dividend growth experienced by TD Bank’s shareholders is hardly unique – other companies have raised dividends significantly in recent years. Will the good times last or is the party going to end sometime? Does the historical record support the prevalent notion that dividends significantly outpace inflation over the long term? US real dividends fluctuated greatly in the first half of the last century, but made little headway so that by 1949 they had just kept pace with inflation. For the next twenty-one years they grew quite strongly, but thereafter fluctuated with no clear trend. $1 of dividend income received in 1900 grew, after adjusting for inflation, to $1.78 by 2000, an annualized (geometric mean) real dividend growth rate of 0.58 percent. The arithmetic mean annual growth rate was 1 percent higher than this at 1.57 percent, reflecting the high volatility of annual growth rates, which had a standard deviation of 14.3 percent. The US experience is hardly unique. In the UK, dividends grew at a real rate of 0.40% per year and 0.3% in Canada over the same time period. In fact, out of the sixteen countries examined, just seven countries (Sweden, South Africa, Australia and Switzerland were the others) posted positive real dividend growth. The authors rightly conclude that “real dividend growth has been rather lower than is often assumed”. Dividend growth is only one component of return. The Gordon Equation suggests dividend investors to focus on the Total Dividend Return which is the sum of yield + growth. It’s perfectly fine to accept a stock with mediocre growth potential as long as one can buy it for a song. For example, a stock with a 10% yield and NO dividend growth will still outpace inflation (3%) by 7%, assuming the investor is reinvesting the dividends by buying 10% more shares each year. It sounds like the authors were looking at the overall markets, not individual stocks. There are companies that increase their dividends and there are companies that decrease (or even discontinue) their dividend payouts. The trick is to find companies that are likely to be on the dividend increasing side. Of course, this doesn’t work out very well for investors using an index fund strategy (since they aren’t stock-picking) but then again, index fund investors aren’t really looking for dividends, they are looking for their returns mostly in the form of capital gains. FJ: I agree with you. However, there is an entire school of stock picking that focuses on buying a low yield stock with recent strong dividend growth. While recent dividend growth has been robust, the Dimson study shows that over the long-term, dividend growth has been modest for the markets as a whole. oxCC: It’s true that the authors were looking at overall markets. However, as investors, on average, our collection of stocks will be a representative cross-section of the markets. Therefore, an average dividend investor, in the past, would have experienced modest real dividend growth similar to the market’s. As an index investor, dividends are a really important component of returns for me. The current dividend yield is a little above 2% and will account for more than one quarter of future returns. The reason the index might not be representative of a dividend growth investor’s portfolio is that some companies emphasize dividends and consistent dividend growth moreso than others. Companies who do not emphasize dividends and dividend growth might choose to freeze or cut dividends in order to fund capital projects, share buybacks, or acquisitions. Companies paying smallish dividends that grow them spratically would likely not be included in a dividend growth investors basket. This would be lost in this data. Also some companies have policies where their pay out ratio is held at a certain percentage of earnings. In this case you might as well look at long term earnings growth and ignore dividend trends..they’ll be one in the same. There is a distinction between current dividend yield and dividend growth. It doesn’t sound like the authors were looking at dividend yield at specific points in time. Obviously there is a link between current dividend yield and dividend growth rates (if the dividend growth doesn’t match the growth of the underlying security then the yield will change). Did the authors look at dividend yields over the same time period? Presumably yields have declined (if constant dollars are used since they were looking at real dividend growth rates). MG: Maybe. The stocks which sport consistent dividend growth today are the survivors and should be adjusted for survivorship bias. It’s true that dividend growth noted in the Dimson study might not reflect the experience of every dividend investor. But I think it does reflect the average experience of dividend growth. By selecting companies that have a history of increasing dividends over the long term an investor focused on dividend growth I think can blow the dividend growth rate of the overall market out of the water. I personally believe that it is possible to have a basket of companies that will generate a dividend growth rate of between 6% and 8% which I estimate is an after-inflation growth rate of between 2% and 5% or so. But that’s the point. A dividend growth investor can (and should if that is the strategy they are using) pick and choose the companies they invest in. So while there is survivorship bias in those companies in terms of their dividend growth rate a dividend growth investor is attempting to exploit that very bias. On the other hand, an index investor should be aware that the dividend growth rate of the general market over time barely beats inflation. Based off this file I calculated that dividend aristocrats stay about 6.5 years on average in the index as of 2004. Also the author of the spreadsheet had calculated that 30% of original companies remain in the index after 10 years. I myself noticed that only 7 companies that were part of the index in 1989, are still part of it ( form the initial sample of 26). Low is relative. I don’t know any dividend growth investors with portfolios yielding less than 2%. The market is made up of high-yield, low-yield, and no-yield stocks. Obviously, no-yield stocks are deadweights as far as contributing to the overall market yield, but by picking only from a universe of dividend stocks, investors can safely assemble a 3-4% yielding portfolio in the current bear market. The paper mentioned that dividend growth was merely keep up with inflation prior to 1949. That’s great news, because purchasing power on dividends was preserved. 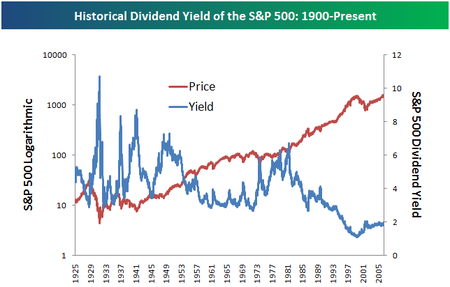 According to the graph below, dividend yields were much higher before 1949. Just by eyeballing it, I estimate the average yield was about 5%. Today, yield is lower but investors are compensated with higher growth, and the growth excludes share buybacks which are part of the overall Net Payout Ratio. A company paying 3% dividends and buying back 3% of shares is yielding a net payout ratio of roughly 6%. I agree 100%. Food inflation doesn’t bother me at all, since only 20% of our monthly expenses is on food. I worry about my landlady more since rents consume 45% of our monthly expenses. Luckily she chose to freeze our rents after the first anniversery. They did. And yes, not only are dividend yields much lower today, the percentage of stocks paying a dividend is far smaller as well. However, in determining dividend growth, they look at how the amount of dividends is growing over time. I disagree. Real returns matter a great deal as inflation is the biggest enemy of the long-term investor. Ahhhhh, but dividends are going to reflect interest rates, and as interest rates have dropped, so have dividends. Any company looking to retain investment through the payment of dividends will adjust the payment to reflect the returns the investor can obtain elsewhere in the market. The trick, as has been stated here is to find a company that not only increases its dividend, but also increases in value. One small holding bought 20 years ago at $4.16, is now worth about $30.00 it has increased its dividend each year since, on average 7% , and just declared it’s 2008 dividend to be $1.00. So, if my math is correct, this stock has increased a nominal 36% annually, and now pays about 24% on my initial investment. Is this the type of stock OxCC would consider for his basket? The article suggests that the dividend barely beat inflation, but that is misleading as the growth is compared to inflation, not total dividend return. Take a stock with a 4-5% return. One could expect about a 3% real return on this stock. Your real return would grow by .58% per year on top of this. This translates into real growth in wealth over the long term before taking capital gains into consideration. Obviously I am a big fan of dividend investing ( judging by my nickname). I do believe that dividend stocks provide the best hedge against inflation over time. Of course there is always the possibility of a catastrophic risk of ruin in any venture possible be it in ultra safe government bonds or a triple A rated corporation. But over time by spreading your purchases across a wide number of equities, you’d be able to at least meet inflation. I don’t know how the research which you are quoting, accounts for dividend reinvestment. But over time, dividend reinvestment provides for a nice income stream in turbulent times. Even if you keep reinvesting dividends in the S&P 500 over a period of 3.5 decades, you will be able to achieve close to 100% yield on cost. In my opinion the only environment that is truly detrimental for stock returns is deflation. Hyper inflaiton could also be bad for the economy as a whole, but it is not necesserily too bad for the stock market. Stocks give you a percentage ownership in real businesses, and as prices increase, these businesses could sell their inventories at higher prices..
DAvid, that sounds like exactly the kind of stock I would consider for my basket. A long-term history of dividend increases through at least one economic cycle. DGI: Dividend reinvestment is indeed powerful. Financial Jungle referred to the Tweedy Browne paper that shows that dividend reinvestment accounts for the vast majority of equity returns. But if the dividends are consumed instead, while dividend growth might be robust at times (like now) or meager at others, the study suggests that over the long-term they keep up with inflation. Can Cap and others, for TSX stocks, where (which website) is a good place to lookup historical dividend rate?